The Love & Carry® stretchy baby wrap is a 5 metres long strip of specially woven and dense fabric that stretches only across its width. The elasticity makes its use much simpler. This kind of wrap is recommended for moms that want to start using a wrap and have no previous experience. Its elasticity helps to hide any mistakes in wrapping, minimizing the mom’s stress in the process of learning different positions. The Love & Carry® Cactus wrap is made of 100 % cotton of the best quality which is only ela.. The Love & Carry® Fuchsia wrap is made of 100 % cotton of the best quality which is only el.. 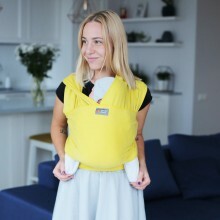 The Love & Carry® Lemon wrap is made of 100 % cotton of the best quality which is only.. The Love & Carry® Lilac wrap is made of 100 % cotton of the best quality which is only elas.. The Love & Carry® Mint wrap is made of 100 % cotton of the best quality which is only elast.. The Love & Carry® Peach wrap is made of 100 % cotton of the best quality which is only elas.. The Love & Carry® Pomegranate wrap is made of 100 % cotton of the best quality which is onl.. The Love & Carry® Silver wrap is made of 100 % cotton of the best quality which is only ela.. The Love & Carry® Violet wrap is made of 100 % cotton of the best quality which is onl..